The trailing or spreading Verbenas make excellent ground cover plants. Planted in a sunny position with room to grow they will quickly form a dense clump. The best varieties are the Tapien series, very low growing to around 10cm or less and forming a dense matt. Brilliant displays of flowers and mid to deep green foliage provide interest year round. Pictured right we have Verbena Tapien ‘Purple Passion, wonderful dense foliage and attractive purple flowers. 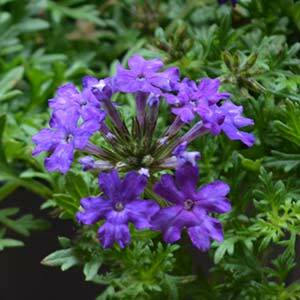 These are an easy care, fast growing plant, drought tolerant once established. The Verbena varieties used as ground covers are mainly the hybrids. In most situations it seems to spread to cover around 1m, so give it room. Foliage is a deep green and finely dissected, flowers are either purple, or pink. Grow them in containers as an underplanting for taller plants. Use them to fill in spaces beside walkways, or mass planted as a dense ground cover plant. Also suited to growing in hanging baskets. Best planted in full sun in a well drained soil. Although once established the ground cover Verbenas are generally regarded as drought tolerant, a little extra water in long dry summers will be beneficial. Prune back to maintain size and shape. Deadheading is generally not required, however if you wish to tidy up, go ahead. Use a slow release general purpose fertiliser in spring to promote strong growth. Do not over fertilise as this can cause poor flowering and excessive foliage growth. Flower Color – Purple, Blue, Pink.